The £575, 000 signing of Sheffield United's Vinnie Jones in August 1991 provoked a mixed response from Chelsea's followers. The notorious midfield hard man had many detractors and his assertion prior to his debut that 'We've got a few boys here who will be useful if it all goes off in the tunnel' was the cause of much squirming. The fact that he won over the doubters so quickly, and so fully, bears testament to the fact that when he let his feet do the talking, he was no mean player. 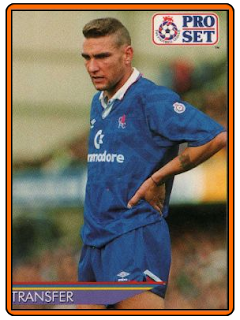 Vinnie made an outstanding debut at home to Luton on the last day of August and set up the opening goal for Graeme Le Saux in a 4-1 victory. 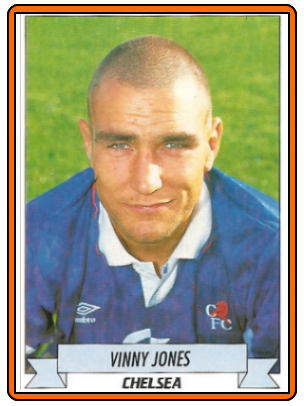 His willingness to interact with the supporters made him a firm favourite on the terraces and before every game, home or away, he would respond to the chant of 'Vinnie, give us a song' by putting his finger to his lips for silence and then belting out the first strains of the old Chelsea favourite One Man Went To Mow. In February 1992 Chelsea travelled to Liverpool having failed to record a single League victory at Anfield for 55 years. To their horror, Liverpool discovered this day of February 92 that the Crazy Gang spirit lives on. Just when the class of `92 had managed to hold their heads high again with pride, two of those kids from the Bash Street Gang turned up to lay down the banana skins once more and the former champions took another heavy tumble. 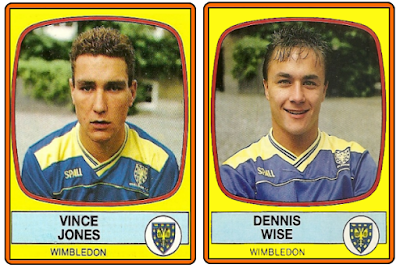 The contempt which Wimbledon always used to show for Liverpool, culminating in an historic victory for what some people saw as Evil over Good one unforgettable day in May four years ago, surfaced again as Vinnie Jones and Dennis Wise, two of their old boys, delivered to Chelsea a historic victory over the Reds. Chelsea had not won a league game at Anfield in 55 years, but records and reputations count for nothing with characters like Jones and Wise. On the contrary, they are like a red rag to them. It is hardly surprising, then, that they treat the ``this is Anfield'' sign hanging over the players' tunnel at Liverpool with such disdain. The story goes that Wimbledon players once defaced it with spittle on their way to the pitch, but Jones, for one, appears to have modified his manners since those days. Instead, on Saturday, he attempted to hang his own sign, which read ``We're bothered ? '', beneath the intimidating Liverpool plaque, but was prevented from doing so by the police. One would hesitate to go as far as to say that he allowed his football to do the talking instead, but he certainly made a fairly poignant statement after 21 minutes with an impressive, dipping 20-yard drive ``I don't suppose Ian St John will give me any credit for it'' over the head of Grobbelaar in the Liverpool goal. It was the Merseysiders who looked bothered then, and though the erratic Rosenthal pulled them level ten minutes later with an emphatic finish, they never displayed the fluency and resolve which had overcome Arsenal in midweek. 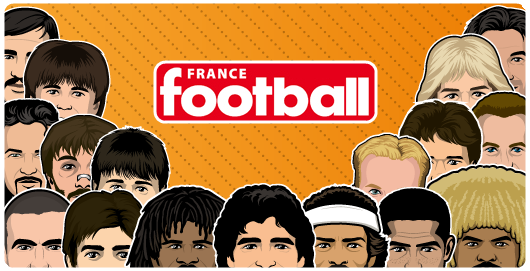 In one of the shortest press conferences on record, 16 seconds to be exact, Graeme Souness, the Liverpool manager, accused his players of committing the cardinal sin of any performer of reading his reviews and believing them. ``Very disappointing the most disappointing performance at home since I've been at the club,'' he said. ``Players were guilty of believing what was said about them since Wednesday night. All in all, a totally inept performance. I apologise to our supporters for that performance.'' And with that, he turned on his heel and left. Thirteen League games without defeat had encouraged talk that Liverpool might yet win the championship. Had they defeated Chelsea, they would have been a mere six points behind the leaders, but this game revealed how much they still miss Barnes and Rush, while the absence of Thomas in midfield and Nicol in defence meant that they were flawed in all departments. Blatant misses by Rosenthal and McManaman prompted Le Saux, the bubbly young Chelsea midfield player, not without some justification, to suggest that Liverpool are not as lethal in front of goal as they used to be. ``I don't think anyone is intimidated by them any more,'' he said. ``Their reputation has almost disappeared.'' Those Chelsea players old enough to know better not to write off Liverpool were content merely to express their gratitude for the opportunity their opponents' predicament afforded them. That included an uncharacteristic slackness in defence which Wise punished for the winner in the 74th minute. It could have been worse for Liverpool, but for Grobbelaar, at his extrovert worst/best, saving Wise's 83rd minute penalty following a trip by Marsh on Allen.